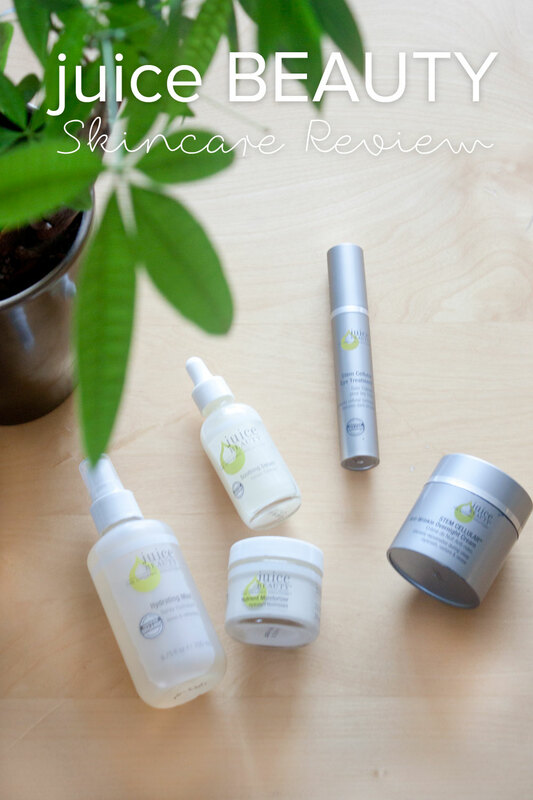 Product Sample: Skincare samples from Juice Beauty were provided to me in exchange for this honest review. 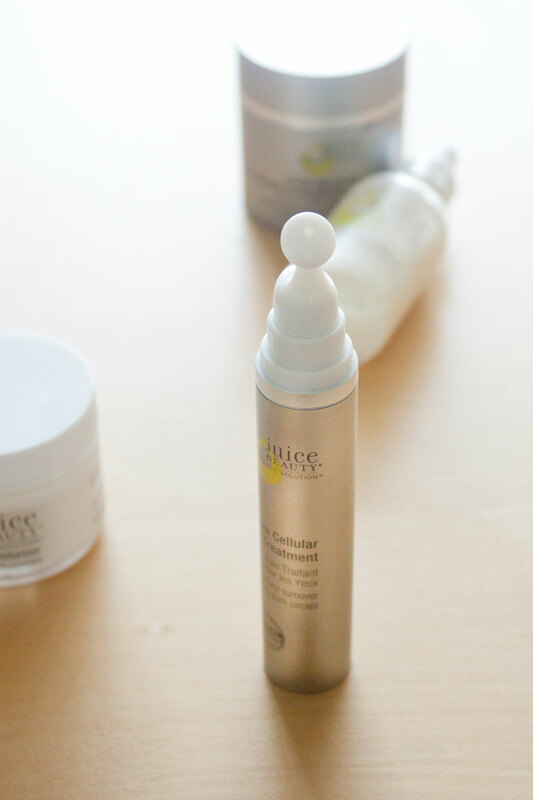 I am so excited to be talking about my experience with Juice Beauty today. Why, you ask? Because I love ALL of the products I’ve been trying for the past month from them. They reached out to me after I shared their Nutrient Moisturizer in the Whole Foods Beauty Travel Bag and asked if I’d be interested in trying more products. Of course, I said yes! Let’s backtrack a bit. Last year I had the worst breakout I’ve ever had in my life. I wish I was exaggerating, but I’ve never had acne quite so terrible. I had one cystic zit that was so bad, whenever I turned my head I wanted to die. It was right where my jawline and neck met, so it was just incredibly uncomfortable. I tried to throw every potent product I owned at it, and it only made the situation worse. When I backed off and focused on hydration and gentle skincare, I found it really helped. Since then, I’ve been on a mission to put the best things possible on my face. One of my big skin issues is dryness. I’m acne-prone, but dry. It makes it hard to find something that’s moisturizing enough without breaking me out. I’ve tried so many night creams that were hydrating enough and then broke me out terribly. Luckily with Juice Beauty Skincare, my skin feels nice and hydrated AND it hasn’t broken me out. Additionally, Juice Beauty uses natural, organic ingredients and is cruelty-free. Win-win-win-win! So without further ado, let’s talk about the products I tried! Hydrating Mist ($22) – This is probably one of my favorite finds. This hydrating mist actually works! I’ve tried a lot of mists and often find that after about 30 minutes my skin is back to feeling dry, parched, and tight. This, however, leaves my skin feeling hydrated without the addition of anything else, and I love using this to refresh my skin throughout the day! STEM CELLULAR Eye Treatment ($45) – The packaging on this eye treatment is like nothing I’ve seen before! One pump is enough for both eyes. I dot half of the pump under each eye and then smooth it in gently with the spoon-like applicator. I find it to be so much more gentle than using my fingers. It works great to reduce my dark circles and rivals my holy grail eye cream! 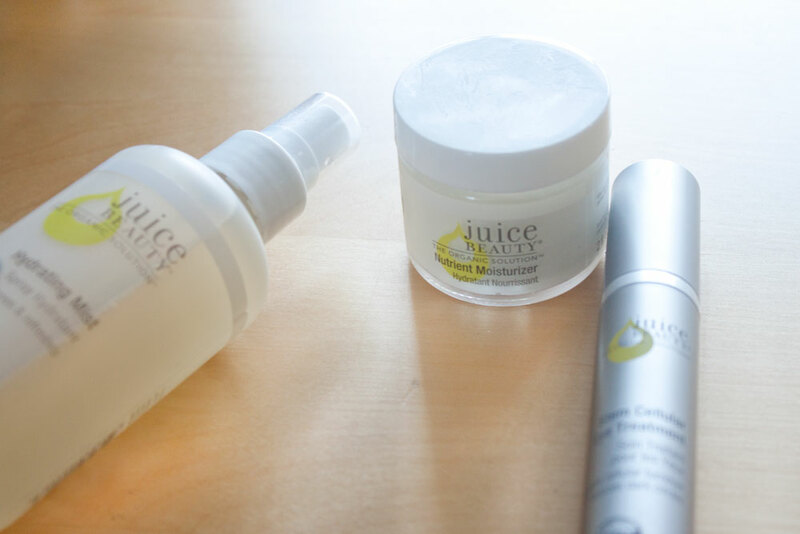 Overall, if you’re looking for a new skincare line to try, I highly recommend checking out Juice Beauty. 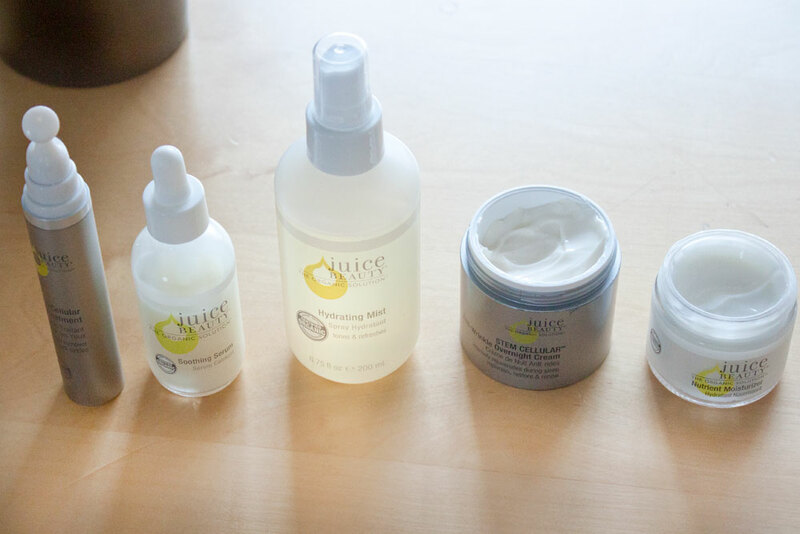 Juice Beauty is carried in store at Whole Foods and Ulta, and I’ve found that both locations do have testers so you can test these out before investing if you’re into that sort of thing. Plus, if you’re interested in trying out Juice Beauty, they’ve offered THREE bundles of these products! The giveaway is on Instagram, so be sure to go double tap the photo and follow both me and Juice Beauty for a chance to win! Have you tried Juice Beauty? If so, what are your favorite products? I’d love to hear about them in the comments! I definitely want to try that eye treatment now! The packaging is so innovative, and the eye cream of course is great too! I have seen these in stores and yet to try because I haven’t heard any reviews (positive or negative). Enjoyed reading what you thought of them and thinking I will try out the hydrating mist. Will be great during the winter months! So glad it was helpful, Morgan! The hydrating mist would definitely be a great product to start with! I’ve been looking for a natural skin care line for a while now. I’ve tried so many different brands and nothing has worked for me. I don’t like using chemical laden products, so this sounds really promising! I’ll give it a try, thanks for the review! Hmm, I like the sound of this skincare line! I don’t think I’ve seen it before; I wonder if it’s available in Canada! I have the hydrating mist and love it! I definitely need to try more of their products. So glad you love it too, Jenny! Hope you get to try more of their products soon. I feel like you can’t go wrong with any of them! Wow, this stuff sounds amazing. I have almost the exact same skin as you do; I’m very dry buy acne prone, so finding something that doesn’t make me oil up and break out can be so hard! I’ve seen other reviews of Juice products and am dying to try them! 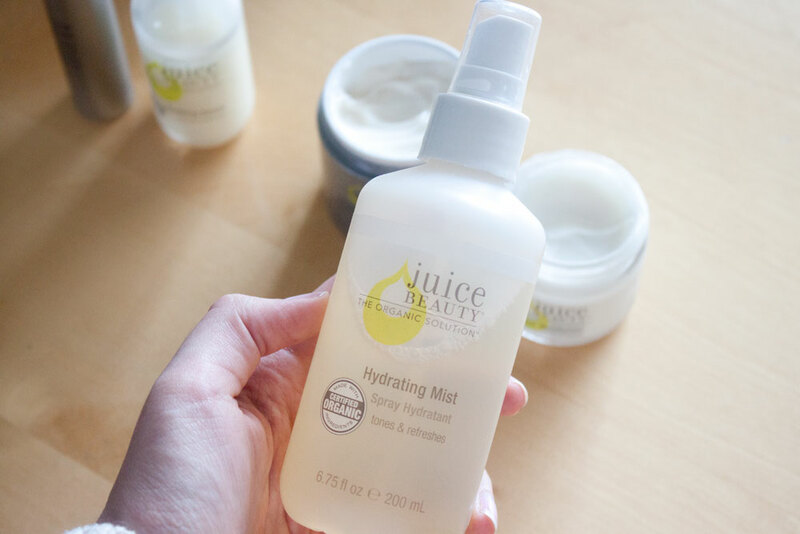 I definitely love the idea of the hydrating mist! The hydrating mist is awesome. Hope you get a chance to try it soon! I love Whole Foods and I am always obsessed with trying new beauty products. I need a new eye cream, I might have to pick up the Juice Beauty one you recommended! Yay, hope you love it Jordyn! I’ve never heard of this line–but I’m going to enter the giveaway now! Awesome, thanks so much for entering Allison! I think I will have to try that mist! Hope you love it, Lindsey! **Fingers Crossed** I would love to try juice beauty! That hydrating mist sounds like a genius invention. I have really annoying combination skin (super dry and then super oily within an hour… I can’t win!) so I’d love to try these products! I entered your giveaway, thanks for sharing! Awesome, thanks so much for entering, Kayla! This all looks amazing! Gorgeous photos, too. I suffer from dark circles so I might just have to try the eye cream! Awesome, hope you love it Macarena! I’ve been hearing such wonderful things about this brand! Definitely need to give them a try– thanks for the giveaway, lovely! I’m so happy that you found a skin care line that works for you! I’m currently on the hunt for something that works for combination skin. I’ve been struggling with cystic acne, as well. Whyyy is it so painful?! Thanks girl! The skin struggle is real. Hope you find something that works well for you soon! Awesome. I’ve been looking for new skincare products .I have really dry, but also sensitive skin .This sounds perfect. A friend of mine is always on the lookout for new natural products to try out, I will definitely be telling her about Juice Beauty! Awesome glad it was helpful!